I’m at a really weird place in my life right now. A few months ago, I quit my seven-year old job in legal marketing to take some time off to refocus my life and priorities. I’ve never not worked full-time for as long as I can remember (since 1997! ), so the prospect of being unemployed terrifies me. Removing that piece from my life has had a profound effect on how I conduct my days: long walks outside have replaced sitting in an office and commuting into work on the bus and subway; my cat’s occasional meowing and small talk with neighbors has replaced daily conversations with my coworkers; and cleaning the house, cooking or taking a yoga class has replaced my task and project lists at work. Neither one is better or more valuable than the other, just different. And I’ve had more time to reflect and think about things without the frustration or stress of work occupying any type of space in my mind. During my entire working career, I was always a type-A, anxiety-filled perfectionist, and I assumed that this recent gift of time off would have shaped me into a more relaxed and centered human being. However, what I’ve learned in the past few months is this: I am and always will be that anxiety-filled person no matter what is going on in my life. Despite having succeeded in several areas of my life, I will always tend to be the kind of person who serially dodges taking risks and fears failure more intensely than anything else, and adjusts my actions accordingly. This way of thinking has kept my life predictable and certain, but has also kept me in the same spot professionally and—in some ways, personally—throughout my life. During my time off, I’ve spent some time thinking about how my life would be different if I weren’t so irrationally anxious, and realized that this kind of energy has also served me in positive ways. The energy that fuels my nervousness and overthinking is the same energy that also allows me to enjoy creating new ideas and to execute and perfect them with an obsessive passion. This blog is just one outlet for that energy, and has become a unique, unexpected and perfect vehicle for connecting with other vegan or veg-curious readers (that’s you! )—so thank you if you’ve actually read this far into this post and continue to read this blog. One of my biggest motivations to keep up the blog is the interaction with, and feeling that I am also a part of, the larger vegan community out there. Although these past few months have definitely made me think about my life differently, I don’t think I’ve changed much as a person. Unemployment has had its benefits, but I look forward to working full-time again in the coming months. 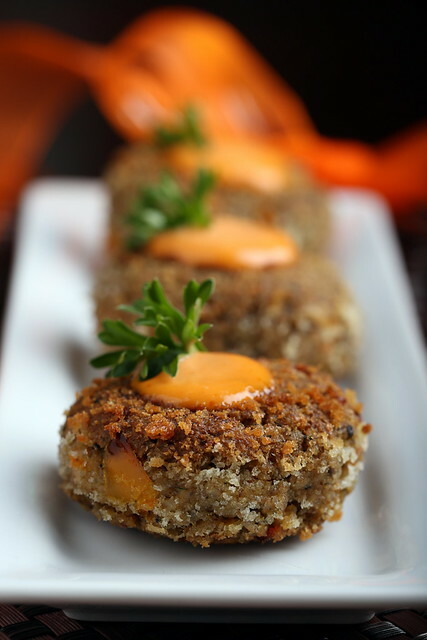 In the meantime, and I guess something that has nothing to do with anything I wrote above, 🙂 here’s a recipe I came up with a few months ago—farro crab cakes. 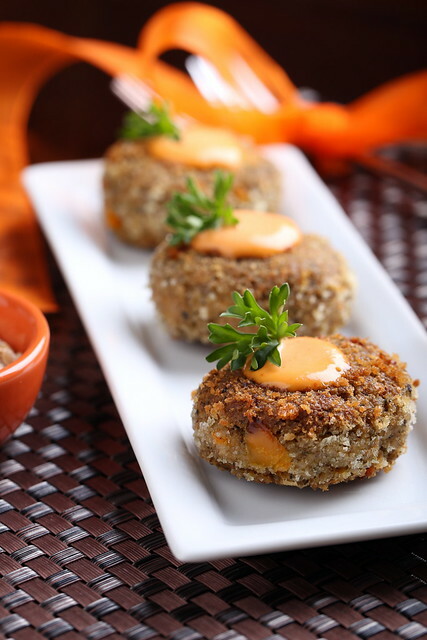 Their texture is super similar to tempeh-based crab cakes, and offers that signature toothsome and flaky-textured bite. You can make the batter one hour or the night before, and all the prep that’s left is a quick breading of panko and a quick brown in a hot pan. These crab cakes are perfectly finished with a dab of sriracha-Vegenaise or creamy dill sauce to make a filling brunch or light dinner. Rinse it in a sieve, then transfer to a medium-sized pot. Add the three cups of broth, bring to a boil, then cover and reduce to a low simmer for about 25 minutes. Check the farro after 20 minutes—it should be slightly chewy and expanded to twice its size. Continue to simmer for an additional 5 minutes if needed, then drain any extra broth off the farro and allow it to cool. Transfer the farro to a food processor and pulse just a few times—you still want it to be a little chunky. Remove it from the food processor and place it into a medium-sized bowl. Next, transfer the rest of the crab cake ingredients into the food processor, except for the bell pepper, and pulse until combined, then transfer it into the bowl with the farro. Fold in the bell pepper and stir to combine. Then, place the mixture in the refrigerator to chill for at least an hour. Divide the mixture in half, then form six equal portions from each half to create 12 equal-sized portions. Roll them into balls, then flatten them out between your palms a bit. Press them into the panko crumbs, tapping off any extra. Heat a skillet over medium heat. Add about a tablespoon of olive oil or some cooking spray into the pan, then fry the cakes until golden brown. Serve immediately with the sriracha or dill sauce. Perfect timing! I really hope you enjoy your first "free" day tomorrow. Mine was certainly weird, but in a good way. I really thought I'd go nuts after one week of it, but I'm oddly comfortable with my dramatically increased free time. I love your blog and "about" page/story! how exciting for you, and BRAVE. i'm interested in seeing what you do decide to do after your sabbatical. i have not played with farro yet, we're trying to get rid of a few grains and stuff in the pantry before i restock with other stuff (i've even put a hold on replenishing RICE!). question: i typically soak grains over night, such as pearl barley, quinoa, etc, is soaking farro required? I just love farro — you can use it in sweet and savory applications, and it even tastes good plain with a little vegan butter and garlic. I've never soaked it, but it may be interesting to do to see how it impacts the texture once cooked! Wow, thank you. I would have missed signing up for Vegan Mofo if you had not put that link to the greater vegan community out there. Love your blog and have made a couple of your recipes with great success (I'm talkin' bout you Sweet Sticky Cashew Tofu). Yes, MoFo is coming up fast this year, glad the link helped! Thank you for your kind words Amanda, and I'm thrilled you like the recipes! Wow, I actually could have written this post (apart from the recipe, and being employed full-time since 1997). Newly self-employed and realising I am still the failure-fearing achievement-chasing never-sit-still anxious person, and that I always will be, and may need to find a way to manage that energy before it becomes negative. So strange to read about your experience right now! I totally agree with what you say about being part of a community – I feel like being vegan and blogging about it really gives you that sense of connection and that need to remember who you are and what is important to you. I am so happy you could relate to the post! I don't usually overshare on the blog, but felt compelled to after rethinking about this subject so much recently. I hope you find a "place" to put some of your energy — it needs to go somewhere! Best of luck with your self-employment gig and thank you for your kind words! What a great idea! 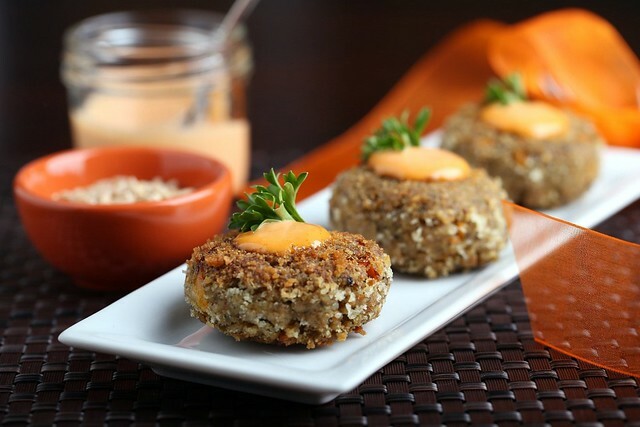 Crab cakes are one of the things I miss since I went vegan. I am so going to try this. Thanks! Farro is such an interesting ingredient to use for crab cakes, the most I've ever used it for is salad. They look perfectly flaky and delicious. My family LOVED this! So super-delicious! We didn't have tahini on hand, so I used peanut butter. Thanks!! So happy you made this and enjoyed. Thanks for your feedback! Congrats on leaving the slave-labor work force & I love the vegan vibe! Specifically his book "Infinite Self"
Really, really, REALLY helped me. Thank you, I will definitely check that title out!